Welcome to how to do a proper front crawl pull! This week I’ve got a lot of great tips for you guys on how to properly do a front crawl pull so that you can feel a lot more confident while you are swimming! So how does one do a proper front crawl pull? This one is probably the hardest one for people to understand because the concept is so vague but… Engage more of your core. Your front crawl pull will improve. Guaranteed. Ok, but how do I actually make that happen? How do I get my core involved? The thing that I would begin to notice is as follows: if you are getting a lot of cramping in your arms and in your forearms, something is probably off. If these areas are getting really sore while you are swimming around, then there is a considerable chance that you are engaging more of your arms and not enough of your core. And that’s not to say that the arm muscles are not utilized in the stroke. What I mean is that the “anchor point” of your pull, where most of the strength comes from, should be your core. The true key to this step is to CONSCIOUSLY ENGAGE YOUR BACK AND SHOULDERS. That is it. When you are pulling yourself forward in the water, notice how your back and shoulder blades are feeling. Are they being engaged? If not, consciously engage them when you are pulling through the water. Getting your back and shoulders involved is going to bring a lot more power and efficiency to your pull. Ok, this is a quick one, but it is worth mentioning. Don’t worry so much about your hands. A lot of people make a big deal about cupping your hands and fusing your fingers together so that you have a perfectly formed paddle when you pull through the water. And maybe to a certain extent, having a cupped hand is important. But in the grand scheme of things, rather than just focussing on the hand, you NEED to engage the entire length of your arm as a paddle, not just your hand. Remember, the hand is not the pivotal point in a proper front crawl pull. A great way to practice this is Boxer Front Crawl. Boxer Front Crawl is a great way to practice your front crawl pull that almost nobody knows about. And it’s so simple. Just form two fists with your hands and try to swim front crawl with fists instead of a paddle. You’ll notice that pulling has just become a lot more difficult. If you can figure out how to still make progress in the water in spite of this change. you will learn how to engage your entire arm a little bit more and you will notice large stroke improvements. This should be by far the simplest for you to start with TODAY and get practicing with as soon as possible. Do you pull all the way past your hip when you pull through the water? I would bet there’s a good chance that you stop and pull your arm back out of the water around your belly button. That isn’t the right way to do a proper front crawl pull. What you should try and always make an attempt at is bringing your hand all the way past your hip when you swim! Remember, the longer a stroke you do, the more propulsion you are going to get out of each pull. Halfway there guys, onto step four! If you are a Splashing Monster when you swim, stop it right now. The more you practice slapping the water on your entry, the harder it is going to be for you to fix your horrid technique at a later date. You must learn how to “glide” into the water with your hand smoothly so that you aren’t wasting a ton of energy slapping a bunch of water around. You see, when you break the surface of the water aggressively, you lose the ability to engage the forces of surface tension on the surface of the pool. So obviously, let’s try and change this. The best way to work at this is to watch good swimmers. Imagine swimming like them. Study it! Building that mental picture in your head will really help you when it comes time to jump in the water! Now I don’t want to get all wordy on everybody because we are nearing the end of the article, but an S Pull is an advanced way to pull through the water that higher level swimmers make use of that will highly benefit your swimming technique. The number one way I would suggest to learning this technique is to find a high-level instructor who can teach it to you personally, but another easy way for you to try and learn if you are into online learning is to check out the Justin Patrick “7 Day Swim” program. I’ve reviewed it on my website and can honestly say that it is fantastic. He goes step-by-step on how you can learn to swim on your own time in an easy to follow online course. If you’re interested in learning more about it, check it out using the hyperlink here. Now, a simple way you can practice an S-Pull and begin to learn it on your own is to practice what I call Pool Deck Dips. When you do them, stand in a pool with the water height right up to your shoulders and put your hands on the deck with your arms and elbows jutted out to the side. Then proceed to push yourself up and out of the water, pushing your hands all the way to your hips so that your legs are still submerged in the pool, but your entire chest has been lifted out of the water and exposed. For those more gym oriented, if you were doing this with a Chin-Up bar, a lot of people would refer to this as a Muscle Up. That image can be helpful in picturing what the motion looks like. Once you’ve tried that exercise out, try swimming and pulling through the water the same way! And that is as simple as it can be for a beginner to try and pick up. You see, the idea behind an S-pull is that your hand and pull will be more powerful the closer it is to your body. And therefore we must avoid diving our hand deep into the water towards the pool deck during our pull! And that wraps things up everyone! How to get a proper front crawl pull. I hope you all enjoyed my article, check out my other articles and sign up for my free ebook! 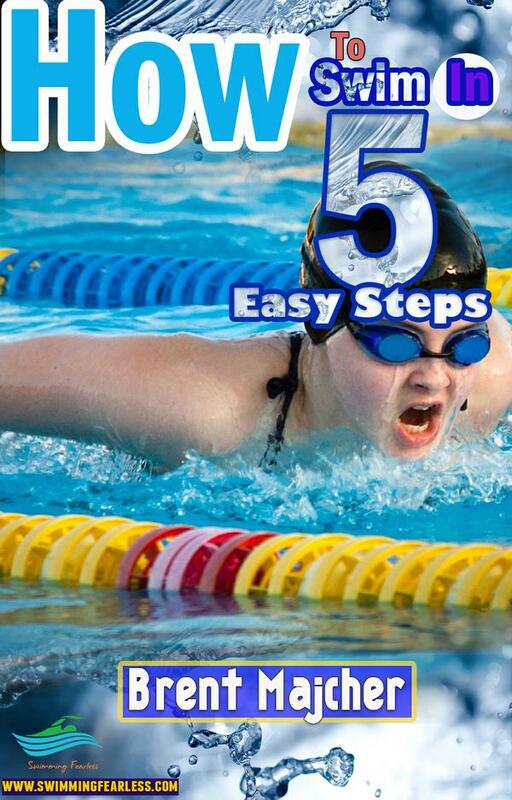 Inside I give you the best ways to learn how to swim on your own without professional swim instruction!